Stream HPC is located on the first floor of Naritaweg 12 in Amsterdam (aka “The small, white building next to FNV”), which is at the Sloterdijk business park. Below you’ll find information on how to get there. When arrived, go inside and use the intercom of 12B. Use the stairs to the first floor, enter the double doors to the left, then you’ll find us at the last office-door at the left. We have coffee and tea, so no need to bring your own. Walking route from station Sloterdijk (trains, buses, tram, metro and taxis), and car route (A10, north-bound and N200 from Haarlem or Amsterdam center). The office is located west of the ring road A10, which makes the location easily accessible by car, via exits S102 and S103. From the ring road A10 the complete Dutch motorway network is accessible. Parking in front of the office is only available when you let us know in advance! From the South, use exit S103 towards Haarlem (see map). From the North use exit S102 towards “Westpoort 3000-9000/Centrum/Haarlem/IJmuiden”. 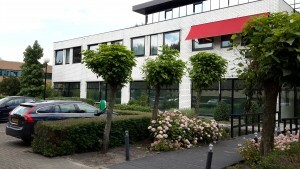 The office is a 4 minute walk from Amsterdam Sloterdijk. See further below for the walking route. 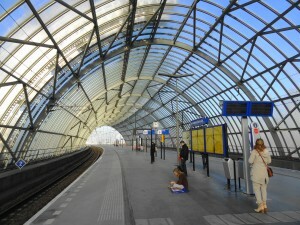 In Amsterdam the Sloterdijk station is the busiest public transport hub after Central Station. It should be easy to get from any big city or any address in Amsterdam to here. Trains to the West: Haarlem, Leiden. Trains to the North: Province of North-Holland. Bus: Lines 15, 36, 48, 61, 69, 82. 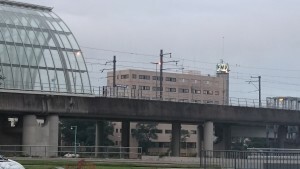 Subway: Line 50, also connecting to Amsterdam train-stations Lelylaan, Zuid, RAI and Bullewijk. In case there are problems with the train to Schiphol, go to Amsterdam Zuid and take the train from there. 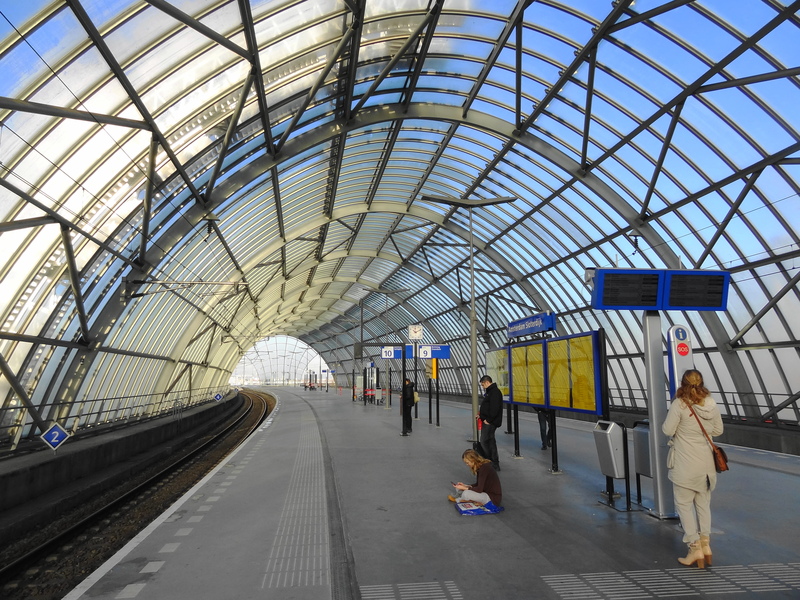 See http://9292.nl/station-amsterdam-sloterdijk for all time tables and planning trips. Remember that in the Netherlands crossing car lanes is relatively safer than crossing biking lanes, contrary to many other countries. In cities the cars (try to) break for you, while bikes simply don’t. No joke. Arriving on train platforms 9 or 10: at the exit turn left and walk under the track. Cross the road via the traffic lights, left from you. Walk between the student housing and the hotels down the hill. You’re now on Naritaweg and we’re the second building at the right. Arriving in main station (train and metro): follow signs to the main exit and cross the little park. Arriving from the bus-station: walk up the stairs to the west, next to the train station, and then cross the little park. Look out for “the big building” (see photo), which belongs to our neighbours. The organisation “FNV” moved out, so there is no sign “FNV” anymore. 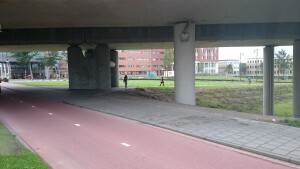 Passage under the train bridge with a biking lane. There are now 384 student apartments built there, so it looks different now. Heading west towards the big building, at the left side of the tracks (see map above). Walk via the pedestrian path in the park away from the station towards the road. Cross both the car lanes and the biking lane, and go under a train track (image at the right). If you’re passing a traffic light, you’re too far to the South. Pass the 4-floor student houses (at your right), tern right and walk between the student houses and the hotels down the hill. You’re now on Naritaweg and we’re the second building at the right – the first building being “the big building”. In Amsterdam you can order a taxi via +31-20-6777777 (+31-206, 6 times 7). Expect a minimum charge of €15. At Schiphol Airport there are official taxi stands – it’ll take 15-20 minutes to get to Sloterdijk outside rush hours. 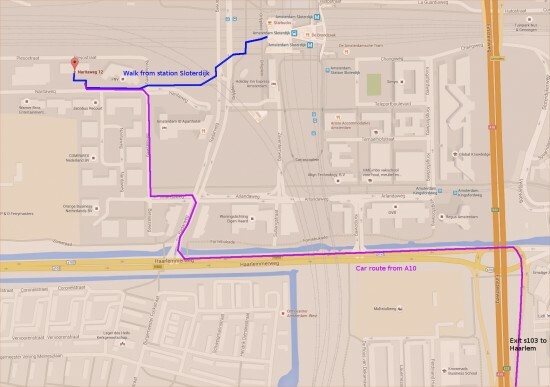 For when you need to get from our office to another place, the quickest would be to walk to Station Sloterdijk, where a taxi stand is situated. Even though most people on bicycles don’t break for pedestrians, please don’t see this as a law you can use yourself. The Naritaweg is connected to all main cycle paths in Amsterdam. There are green routes to Haarlem (via the city gardens) and Central station (via Westerpark). For the rest Google maps can suggest quite efficient routes for bikes. When the weather is really nice, continue just 25km further to get to one of the nice beach cafes after meeting us.